8.3 "From Chicago to Chiapas"
14 “Revolution at the Crossroads"
Young Democratic Socialists of America is the youth arm of the Democratic Socialists of America. Until August 2017 it was known as Young Democratic Socialists. Newly elected Young Democratic Socialists of America national officers (L–R): Matthew Wolfsen, Ga. Tech; Eliott Geary, U. Tn.-Chattanooga; Ajmal Alami, Va. Tech-Blacksburg; Amelia Blair-Smith, Carleton College, Northfield MN; Sebastian Uchida Chavez, City College of NY; and national staffer Anna Bonomo. Young Democratic Socialists of America National Coordinating Committee, 2017-2018. Those indicating intention to attend on the Wherevent website included Bhaskar Sunkara, David Littman, Emma Lucia Llano, Mark Benjamin Vondrasek, Andrew Shelton, Jameson Goetz , Chris Maisano , Ryan Bruckenthal , Juan Antonio Hernandez, John Guzek, Daniel Ezra Moraff, Joseph Schwartz, Joshua Nodiff, Heidi Easton Chua Schwa, Rahel Biru, Winnie Wong, Brandon Kemp, Sara Ali, Neal Meyer, Michele Rossi, Valencia Barbosa-Ferrer, Jason Hugh Korzelius, Mercy Villa, Barry Goldberg, Spencer Brown, Paul Goodspeed, Alex Kudeyar, Joey Iannitelli, Sean Bailey, Kayla Popuchet, Ben Packer, Alex Nitecki, Alex Nitecki, Bruce Haskin, Noelle Flan, Adam Goldman, Patrick Bon Tonissen, Patrick Bon Tonissen, Ethan Earle, Jack Suria Linares, John Richard Nolan, Byrne Hollander, Meryssa Dickerson, David Duhalde, Riaasa Muntaz, Desiree Feliciano, Louie Messina, David Lorenzo III, Priscilla Cordero, Kelsey Fatu Lizotte, Sean Monahan, Tonee Burley, Diana Dang, Orlando Escobar, Claudia Marroquin, Michelle Denise Fisher, Hoang Do, Kate Bush, Nora Evita Aresti Osis, J-anie Segui, Michael Brandini, Jake Burger, Ashley Rodriguez, Darci Collins, Shlomo Boukai, Russell David, Jonny Tsunami Iezin, Ryan Adler-Levine, Shelby Murphy, Karie Ames, Adam Joseph Cardo, Eric Dolan. Jason Schulman - On the editorial board of New Politics and Democratic Left. Organizing Committee Rutgers University (New Brunswick, NJ) Andrew Foltz-Morrsion, Flavio Hickel, Jr. The 1993 DSA youth section Winter Conference was held February 12-14 at the The High School for the Humanities, New York. Fifty young DSA activists gathered in Slippery Rock, Pennsylvania during the weekend of August 19-22 1993, for the annual Summer Conference of the DSA Youth Section. Speakers at the conference included Jack Clark, Mark Levinson, and Joseph Schwartz of the DSA National Political Committee; Rafael Pizarro of the Committees of Correspondence; Julia Fitzgerald of New York DSA; Terri Burgess of Cleveland DSA; Hugh Cleland of Suffolk DSA; and Carmen Mitchell of Oberlin DSA. Speakers included Joseph Schwartz, Bill Fletcher, Jr., Christian Parenti, Gayatri Spivak, and Damu Smith, "who gave us the “big picture,” described and explained structural injustice at home and abroad, and got us fired up to continue and intensify the fight for a better world." Others included , Frances Fox Piven, Steve Max, Stephen Eric Bronner, Clark Herndon, Tessa Garcia and Hector Soto. 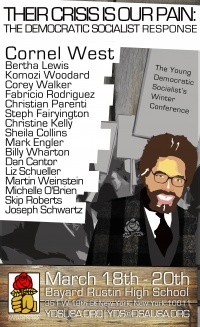 From February 27th to March 1st, 2009 Young Democratic Socialists held its national outreach conference, “Beyond the Ballot: Making the Movement Matter,” at the Academy of Environmental Science in New York City. The event focused on developing strategies for building progressive and radical social movements to push the Obama administration to the left. YDS successfully increased the prominence of socialist politics in workshops and plenaries while articulating why building a democratic socialist organization is necessary to achieve even moderate reforms, let alone a serious power shift from capital to labor. Amy Goodman, host of Democracy Now!, spoke on the plenary “Now, the Hard Part: Movement Building Under Barack Obama,” with Democratic Socialists of America member Bill Fletcher, Jr., a veteran radical trade unionist, and DSA Vice-Chair and Temple University Professor Joseph Schwartz. Reminding the audience of the important role that media play in making and breaking progressive change, Goodman encouraged activists to use grassroots forms of communication, while admitting the limitation of mainstream media in promoting anti-establishment viewpoints, even when they are popular. Fletcher reminded the audience that socialism is more than just a topic for study groups and spoke about the need to critically examine social movements and organizations in order to better the movement we already have. Schwartz proclaimed that there is social democracy in the United States – but that it is restricted to the affluent in American suburbs with their excellent public schools and services. He added that a key goal of democratic socialists is to expand such social benefits to all. All speakers agreed that the Obama administration offered an opening to social movements but that we need to have one foot in the system and one in the streets. Visible protest with direct demands would help distance Obama from his corporate backers. The next plenary, “Student Debt: The New Indentured Servitude,” fit right into YDS’ national programming, as the organization, at its Summer Conference, voted to make student debt a national priority. The panel featured academics academics Christine Kelly and Jeffery J. Williams and was moderated by leading YDS and New Jersey intercollegiate activist Michael McCabe. Kelly, a historian of student activism, discussed the fight against tuition increases in the days of Roosevelt and afterward, noting that only organized student bodies could successfully fight against raises in fees and for increased funding. The closing panel was “We are an Intergenerational Movement!” with DSA Vice-Chair and Midwest Academy trainer Steve Max and journalist and author Liza Featherstone. Though he would offer no advice to student activists on how to organize themselves, Max did explain that the socialist movement had helped change the U.S. for the better. While not always featured prominently in textbooks, socialist organizations have helped activists become smarter and more organized movement builders. Featherstone stressed the critical role socialist organizations play in building organic activists and intellectuals. The 2010 National Conference, A Real Change for Change, will be held March 5-7 in New York City, New York. Speakers are to include Cornel West, Gayatri Spivak, Christian Parenti, Liza Featherstone, Bertha Lewis and Frances Fox Piven. The workshops on Saturday provided a valuable space to hear different perspectives on the resistance. They covered several important topics, from the labor movement to international perspectives, to critiques of intersectionality. Of particular note was the “Skills Training to Fight the Right on Your Campus” workshop, led by myself and fellow Anti-Racism Working Group member Javier Miranda, and moderated by YDS Coordinating Committee member Andrew Shelton. During the last day of the conference there was a final set of plenaries and group discussions. Longtime DSA member Michele Rossi and CUNY Professor Nichole Shippen spoke about socialist feminism and the importance of resisting the liberal feminist narrative of Hillary Clinton and Sheryl Sandberg, who prioritize women in power over the needs of working-class women. Workshop topics included building sanctuary campuses, socialist political education, and queer liberation. In the last hour of the conference, attendees reflected on their successes, the challenges ahead, and how to best fight the Trump administration. In 2002 Young Democratic Socialists, was a member of the National Youth and Student Peace Coalition.. This page was last modified on 9 December 2018, at 19:24.